"From Pavonia to the Garden State: New Jersey's Dutch Past" - September 22 - 24, 2016 ~ The History Girl! 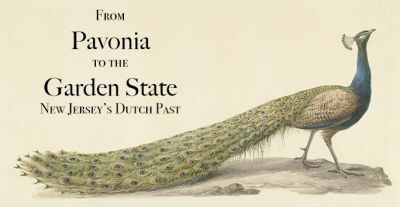 "From Pavonia to the Garden State: New Jersey's Dutch Past"
The 39th Annual Conference of the New Netherland Institute will take place for the first time in the state of New Jersey. Located between the Hudson and Delaware Rivers, New Jersey has often been neglected in favor of more dramatic developments to the east and west. However, as the site of Pavonia, an early patroonship with major agricultural potential, and as the geographic connection between New Amsterdam and the Delaware River settlements, the Garden State’s seventeenth-century origins well deserve our attention. The conference and its companion events will take place over three days, beginning on Thursday the 22nd of September and concluding on Saturday the 24th. Friday morning’s session will explore the trials and tribulations of the early years of Dutch colonization in the region, with the afternoon session exploring the survival of Dutch heritage in New Jersey following the final transfer to the English. The program will be enriched with two additional sessions on Saturday morning, beginning with a panel discussion with NNI’s Emerging Scholars on their decision to study New Netherland. The morning will conclude with an edifying session on Dutch fortifications in New Netherland. Friday night's dinner will feature a talk by Elizabeth Bradley, the author of Knickerbocker: The Myth Behind New York, a cultural history of New York’s first mascot. In this session, Elizabeth Covart, independent scholar and host of the popular podcast “Ben Franklin’s World,” will moderate a panel with three of NNI’s Emerging Scholars in which the Emerging Scholars will discuss why they chose New Netherland as their field of study. 7:00: Dinner & awards at the Rutgers University Inn and Conference Center. The dinner will feature a talk by Elizabeth Bradley, the author ofKnickerbocker: The Myth Behind New York, a cultural history of New York’s first mascot. For a quarter of a century, the New Netherland Institute (NNI) has helped cast light on America’s long-neglected Dutch roots. Created in 1986 as the Friends of the New Netherland Project, it has supported the transcription, translation, and publication of the 17th-century Dutch colonial records held by the New York State Library and State Archives. These records constitute the world’s largest collection of original documentation of the Dutch West India Company and its New World Colonies. They represent an irreplaceable resource for researchers exploring this important chapter in American history, with its legacy of cultural traditions, and its qualities of tolerance, diversity and entrepreneurship. As an independent, non-profit, nongovernmental organization, NNI now supports the New Netherland Research Center (NNRC) in partnership with the New York State Office of Cultural Education (OCE), the parent agency of the State Library and State Archives. Opened to the public in November 2010, the New Netherland Research Center is located in the New York State Research Library. It provides a permanent location where students, educators, scholars, and researchers worldwide can access translations of early Dutch colonial manuscripts and a vast library of early documents, books, and reference works that tell the fascinating story of the Dutch global reach during the American colonial period and its lasting impact on today’s world.